US Army Research Laboratory scientists have made a major breakthrough in increasing single-cell battery energy density by an astounding 30 percent. 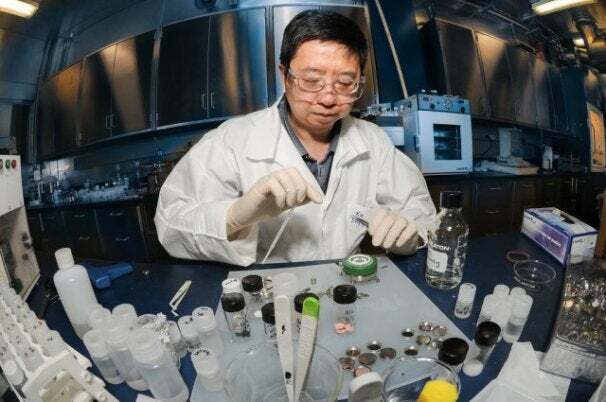 A small group of Army Scientists developed a new additive compound that’s mixed into the batteries' electrolyte. The scientists believe that their patented substance "preferentially" reacts with the electrode to form a stable interface that allows the battery to operate at a level beyond their normal voltage. A single-cell battery can normally output a maximum of four volts. A battery treated with this new substance, however, can push five volts. It might seem like a small change, but it is actually a 30 percent increase in energy density. "This 30 percent is actually quite a big deal," said Cynthia Lundgren, electrochemical branch chief at the US Army Research Laboratory, in a release. "Typically improvements range about one percent a year with a few step changes." The first application of the research will go toward making lighter, energy-packed batteries for soldiers. The additive process will probably trickle down to civilian sector eventually, and soon enough we’ll hopefully see devices powered by batteries that last even longer without adding any bulk.